Vitamin C is a water-soluble nutrient. Your body doesn't store vitamin C, so you must continuously get it from supplements or food. This vitamin plays a role in the production of leukocytes, white blood cells that help destroy disease-causing fungi, bacteria and viruses in your body. Vitamin C may also decrease your risk of heart disease, according to the Linus Pauling Institute. Citrus fruit and pineapple are rich in vitamin C, but they also contain abundant citric acid. Several foods can help boost your vitamin C intake without adding citric acid to your diet, however. Some vegetables can add a wealth of vitamin C to your diet without much or any citric acid. A 1/2-cup serving of broccoli contains about 60 milligrams of vitamin C. A 1 cup serving of boiled asparagus provides about 43.9 milligrams of this nutrient, a cup of fresh peas with edible pods contains about 76.6 milligrams and a baked potato contains about 20 milligrams . Additionally, a cup of raw spinach provides about 15 milligrams of vitamin C.
Adding edible greens to your diet can help boost your vitamin C intake while avoiding citric acid. Greens can be served as side dishes, either alone or over brown rice, or included in soups, casseroles and stir fry dishes. A cup of boiled dandelion greens contains about 18.9 milligrams of vitamin C, while a cup of mustard greens contains about 35.4 milligrams and a 1-cup serving of boiled collard greens provides about 34.6 milligrams. Finally, a 1-cup serving of boiled beet greens contains about 35.9 milligrams of this vitamin. Like vegetables and greens, melons are low in citric acid; however, they provide a wealth of vitamin C in your diet. A 1/2-cup serving of cantaloupe offers about 35 milligrams of this vitamin, while consuming a 1-cup serving of honeydew melon adds about 30.6 milligrams of vitamin C to your diet. 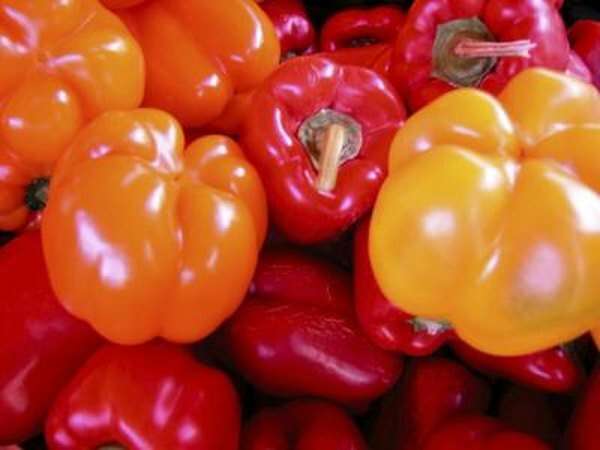 Peppers are abundant sources of vitamin C, but do not add significant amounts of citric acid to your diet. A 1/2-cup serving of red bell pepper contains about 95 milligrams of vitamin C, and the same-sized serving of green bell pepper contains about 45 milligrams. Additionally, one red or green chili pepper provides about 45 milligrams of vitamin C, and a 1/4-cup serving of canned jalapenos contains about 26 milligrams. The recommended daily intake of vitamin C is 75 milligrams for women and 90 milligrams for men. Pediatric recommendations range from 40 milligrams per day for toddlers to 75 milligrams per day for male adolescents and 65 milligrams for female adolescents. There is no reliable scientific evidence of vitamin C toxicity, even at doses up to 10 grams per day for adults; however, check with your doctor before consuming more than 2,000 milligrams per day or allowing a child to consume more than 400 milligrams per day.